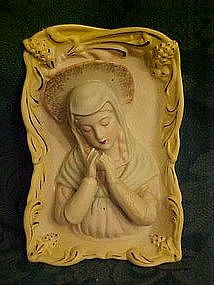 This lovely vintage wall hanging is sculpted from bisque porcelain and finely hand painted in great detail. The Virgin Mary is very lovely and in perfect condition. No marks or stickers to identify this lovely lady's maker. Measures 4" x 6". Looks like Lefton but not sure.Has the molded holes with original string on the back to hang on the wall.